More recently, I have started to juice on a regular basis. Now with such pure motivation for overall wellness and health, I exhort others to do so as well. 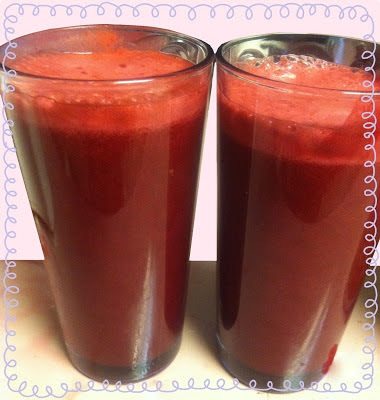 Juicing is the extraction of juice from fruits and/or vegetables. Primarily the health and nutritional benefits that come along are a plus! Also it's a good way to cleanse with a boost of vitamins and minerals. Consider fruits and veggies such as leafy greens for folic acid/vitamin k and citrus for zinc/vitamin c. Although, the main focus of today is, *drumroll* if you will, beets! Just a glimpse of a few of the vitamins and minerals found in beets are: folate, manganese, potassium, vitamin c, magnesium, iron, etc. As for this particular beet recipe, continue to read below. Be sure to wash all ingredients with plenty of baking soda. Then, cut and slice in relative proportion to fit into your juicer; there is no need to remove the peel. NOTE: Recommended to line the pulp bucket with a bag for easy cleaning. Use a pitcher or a large enough container to collect the juice. 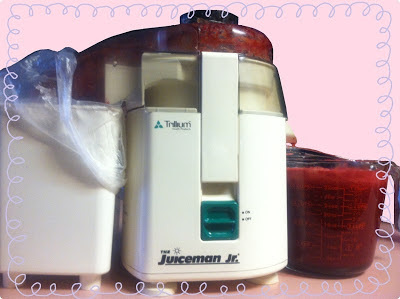 Now, proceed to extract the juice by processing the ingredients. Stir for an even mixture. Pour in a glass, drink and enjoy! Always feel free to concoct your own juice to your preferred taste. Keep in mind the portion size, which may vary upon the size of your fruits and veggies as well as how much is added. Here I managed to make just over 4 cups of juice. Perhaps, I'll share some additional juice recipes in the future. Until then, drink up!